I shared a little bit behind my reason for wanting Invisalign (and the self-imposed drama from the first opinion I got) here. However, I never really got into the nitty gritty of it all. 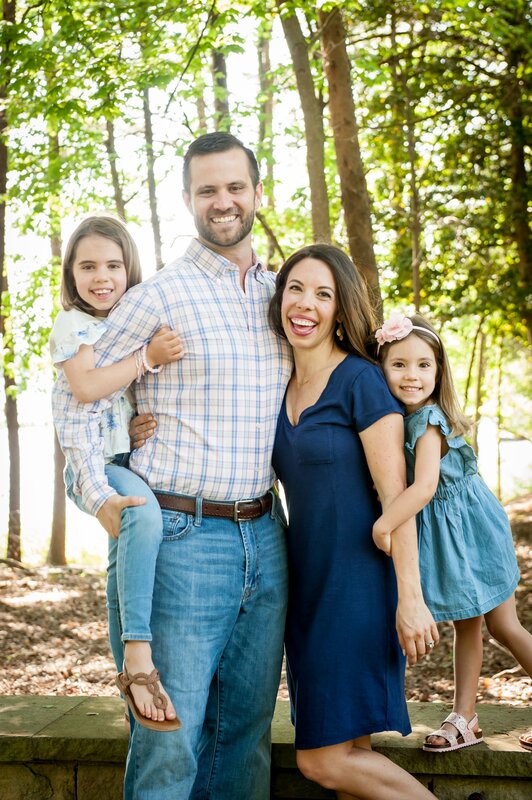 Before I started my Invisalign treatment I had a lot of questions, so I’m hoping that this post will help answer the same questions I had before I got started for those looking into it. Currently I am six weeks into my treatment, so here is a little play by play to how the process has gone. My dentist had recommended a night guard for me since I clenched and grinded my teeth in my sleep. This resulted in pain and tension in my jaw. Additionally I wanted to straighten a crooked bottom tooth and stop a front, upper tooth from poking out further, so I figured it would be wise to do that before paying for the mouth guard. I went to see an orthodontist that my dentist recommended. That was a bust. Not sure where to turn to next, I found a coupon in the mail from $500 off Invisalign treatment at a local orthodontist and decided I might as well go in for a consultation. At the initial consultation, they took pictures and looked at my x-rays. They poked around in my mouth and concluded I would be a good candidate for the treatment. They estimated it would take about 9 months to get the results I was after. I was told several times the importance of wearing the trays 22 hours a day, and had to agree that I would abide by that on several occasions. It sounded good to me, so next we discussed payment. I had checked my dental insurance before going in. I found out that insurance would cover about half the cost. From there, I had a $500 off coupon (which they said had brought them in so many new patients) and finally, I got an additional 5% off for paying in full. It still wasn’t cheap, but much less expensive than jaw surgery for fixing my bite and jaw tension. At my follow up appointment, I paid the balance, then the tech used a tiny camera on a very expensive piece of equipment to take detailed pictures of my teeth and bite. When she finished, it compiled them together into a virtual mold to send to Invisalign. They explained this would help determine how many attachments I needed, where they would be placed and made for a much more accurate plan than an actual mold. Roughly three weeks later, I got the call that my trays were in and I needed to come in to get my attachments to get started. When I arrived, I got to see the projected before (on the left) and after (on the right) pictures. The results looked good to me! Peace out gap and overbite! I was so excited by the after pictures and by the news that I didn’t need any attachments on my front teeth. They applied the attachments, which are small, smooth plastic “bumps” to specified teeth with a bonding agent. These stays on your teeth the entire length of your treatment and help move the teeth more efficiently by applying pressure on certain points of the teeth. I have four attachments on my lower left side, one on my lower right side, two on my upper left side and two on my upper right. I’ve heard some people find them really annoying, but they don’t really bother me. Once the attachments were put in place, I received my first set of trays and my next 2 sets as well, since you switch to the next tray set every two weeks. They made sure I was able to pop them in and out on my own, then sent me on my way. However, that evening, the pain set in. Under the notes I took, I just have OWWWWWWWW written. It hurt. For about three days. Not only my teeth, but also the underside of my tongue was scratched up because I kept exploring the trays with it. On one hand, I was thrilled it was moving my teeth, but on the other, I wondered if I could deal with this every two weeks when I changed trays. After the third day, the pain subsided. Also on about the third day, I could tell my bite was already completely different. My overnight clenching pain was completely gone as well; I’m sure it was partially due to the fact the trays act as a mouth guard. The pain, a slight lisp that took a bit to learn to correct, feeling like I was pulling my teeth out when I took the trays out, not eating or drinking whenever I wanted (have to take the trays out for everything except plain water). I was taking excellent care of my teeth, my jaw tension was gone almost immediately and the two subsequent sets of trays (changed every two weeks) didn’t hurt at all. Six weeks in, I am happy about where I am, but I can also see how exciting it must be to be finished with the treatment. It’s annoying having to pop them in and out all day long and brush before putting them back in. At least I’m not in any pain and seem to be seeing results. I’m going in today to see my orthodontist for the first time since I received my trays to ensure that my teeth are moving as predicted and receive my next four sets of trays. Whew, that was more detailed than I originally intended, but if anyone is curious about the process, I hope this helped! If you’ve had Invisalign, what was your experience like? Pros/cons? Have you ever had to do any orthodontic work as an adult? I’m surprised by how many of my friends have had braces, Invisalign, teeth pulled, etc as adults! I keep going back and forth about whether I want to do something to my teeth. Thanks for sharing your experience. That was really informative, because invisalign is definitely an option I would consider. I’m glad you like ’em so far! My ortho gave me what is essentially a piece of brillo pad, and I was able to rub that over the edges of new trays so there weren’t any sharp bits. Made them so much more comfortable! I did an Express 10 case, and then ended up having to get two sets of refining trays (seven the first time, four the second time). And I initially chose the Invisalign retainers, but my teeth started to shift back and I ended up having permanent retainers put in. I’m very happy with that choice! Oh, I wish they would have given me the brillo pad- so smart! I’ve heard a couple people say they opted for permanent retainers at the end. Glad to hear you are pleased with them! Interesting. Thanks for sharing!!! Glad it is going well. Brittany-is the Invisalign comfortable to sleep in at night? Aside front it bothering your tongue from the rough part? I don’t have a night guard yet– I just sleep in my Invisalign trays. They don’t bother me at all at night and in fact, they almost immediately helped reduce the tension and stress I had in my jaw from night time clenching. I just finished a couple weeks ago. I am wearing my final aligner now that I’ll keep for years. I was on the invisalign express route, and was told 10 trays. It ended up turning into 17! I cannot stress the importance of wearing them all the time. I think that is what made my plan longer than it should’ve…or just they like to think your teeth will change quickly but there are always hiccups. I had the top only, and 3 attachments on my fang teeth. I think that’s what you call them ,ha! Anyway, I loved the outcome SO much. Though it was gross cleaning them and taking them out to eat, it was so worth it. One thing I must say is STAY AWAY FROM TURMERIC. It will completely stain your aligner and you don’t want to have to wear a fluorescent yellow aligner for two weeks. Trust me, I had to and it look like I took a highlighter to my front teeth!! Good luck with it!!!! I am down to my last 2 sets! I had similar issues like you with clenching and jaw pain – and my bottom teeth were crooked from when my wisdom teeth were coming in. After the first few months the pain of a new set lessens, I just have some dull pain the first day of a new set. I use these https://www.amazon.com/gp/product/B00KNXIDH6/ref=oh_aui_detailpage_o02_s01?ie=UTF8&psc=1 to keep my trays clean. I usually soak them when I get in the shower. Good luck! Oh, thank you for the link to the cleaner! I’ve been brushing the heck out of them but like the sound of these! Thanks for sharing. I’m looking into getting Invisalign for my cross bite & front tooth that shifted. I had braces 20 years ago, but stop wearing my retainers in college. Mine is not covered by insurance (only children’s orthodontics is), so I’m saving up for it now. I had a spring retainer before my wedding, but stopped wearing that too. Lesson learned-wear your retainers! Same here with the retainers! I had braces for 5 years (thank you mom and dad!). I had retainers that I never wore and when I finally tried to go back to them, they would fit in my mouth anymore. Lesson learned the hard way for sure! I am so interested in this post! I also had braces for 5 years as a kid and still have a permanent retainer on the bottom but my teeth still shifted! I would love to get it all corrected. I had no idea how Invisalign worked…ill have to do some research now! I had ALLL the orthodontic work when I was a girl. I had braces for two and a half years, teeth pulled, wisdom teeth surgery, everything. But I didn’t find it to be too taxing because my brother had it all, and more. He had braces for 7 years! From the age of seven to fourteen, so when he finished, they’d been on for half his life. To this day we both still wear our retainers to bed because we don’t want to go through it again. I’m thankful I had the braes in middle school though. Julia @ Lord Still Loves Me recently posted..Hi hi hi! My best friend had Invisalign and they worked great! And my boyfriend’s mom has them now and I had NO IDEA until she told us she was wearing them! How were they to sleep in?? I was told I needed braces when I was 16 and I scoffed at the idea. Now that I’m older and my teeth are getting rubbed down, and I have a fang that isn’t quite in alignment and messing with my jaw more… I’m curious. I might need to look into it. The attachments didn’t bother me much, except I had to have buttons and wear rubber bands with my Invisalign treatment! My overbite was that bad. Having the trays really improved my dental hygiene (not that it was lacking before!) and kept me from mindless snacking! My first collection of trays didn’t get the job done and I had to have another set ordered. I wore them for well over a year and I was so ready to be done with them! I’m really happy with the results, though. I loved your post! It was incredibly perfect timing–I just started Invisaline yesterday. And I think the two things that I’m having trouble with is not eating or drinking anytime I’d like to (I usually eat what my girls don’t finish during meals and snacks!) and the rough spots on the trays. I’m excited to have someone to go through it with though!! So thanks again Brittany!! This is such a lovely post, great to see so much info int he, very informative! Glad to hear you managed to sort out the jaw tension too, that can be a painful one. I really enjoyed your post. I am on week 3, wearing tray 2 out of 11. Did you or anyone else here experience difficulty closing your lips without muscle tension or resting your jaw without your teeth touching? If I close my lips my mouth looks pretty funny. My bite was fine before and had a nice profile, am doing Invisalign to correct minor relapse after not wearing retainer for a few years. I experienced a little difficulty trying to close my lips near the beginning but it got better as I went. If you have any concerns, talk to your ortho though. Mine was helpful in addressing and concerns I had in a timely manner! My biggest issue so far… second week in… is the chapped lips. I think my mouth must be overproducing saliva to try to rid the stranger in my mouth and the result is great thirst and wicked chapped lips. I came to this forum wondering how long it would be until the lips went back to normal. I am on tray # 7 and have chapped, cracking lips too. I keep a tube of Vaseline lip therapy advanced healing with me at all times and use a straw when I drink water so I don’t feel like I’m eating Vaseline. Thank you! I get them tomorrow! My biggest question – what did you do when you had a girls’ night out? I’ve heard some people leave in the trays and drink maybe clear liquor drinks or white wine. I think that’s going to be my biggest challenge – no way do I want to prolong treatment because I need to have them out for hours if I have drinks with my girlfriends! Thanks for answering. I have them now, just started two weeks ago. My orthodontist said I could drink with the trays in my mouth. White wine and clear drinks. I’m a red wine drinker, but will put up with white while I do this. How long was your treatment? 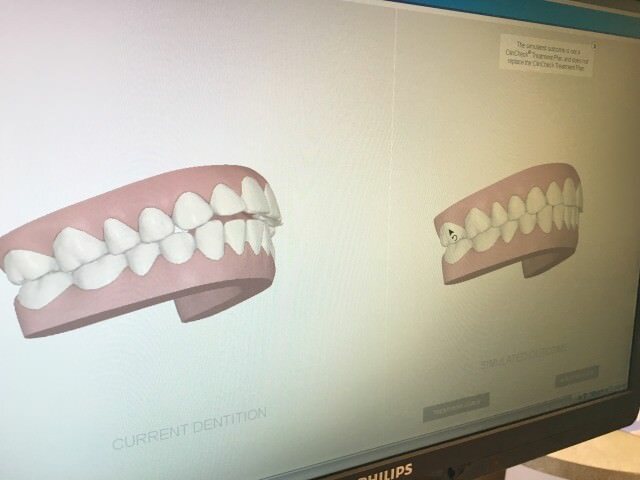 I am currently on tray 4 of 5 but on the projected finished treatment I still don’t feel like my end result has my lower teeth completely straightened like I’d like them to be. 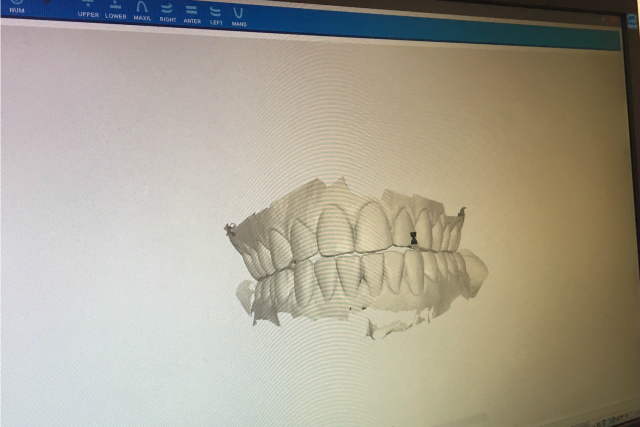 Do the refining trays continue to align your teeth?? Definitely talk to your orthodontist about your concerns. I did not have to do any refining trays, as my final placement of teeth/bite was what I was after, but I did have to wear my retainers all day long instead of just at night when I first got them. I’ve been really happy with my results! Firstly, Thanks for this post and providing a platform to to get some invisalign related answers. I just got mine about 2 months ago. I have few questions for you. did your treatment extended the actual time duration orthodontist gave you ? And what did you use to keep your aligners clean ? I am used to drinking coffee thought out my day. Do you think it’s OK to drink warm cup of coffee with aligners on ? I can’t remember exactly, but my total treatment time was really close to what was predicted, maybe give a week. I used a dental cleaner to wash my trays- the kind that you drop in and it will fizz up in a cup of water. I really would be careful about drinking anything with color with the trays in. I was pretty careful and they still were slightly yellowish at each two week switch. If you have to drink coffee, definitely use a straw and rinse your mouth with water afterwards. Good luck with your treatment! First of all thanks for sharing your experience. I was confused a bit whether I want to go for Invisalign treatment or not but this post makes me clear to take a decision. Great write up on your experiences – you have given me hope! I started invisalign 5 days ago to be exact. The first night was tough! I took an alieve and it really helped. The next morning when I took the trays out for the first time to brush, I thought my teeth were going to fall out into the sink lol (they didn’t). The first couple of days I found it difficult to eat anything and the sheer pressure of just closing my teeth together, even with yogurt hurt. It’s still hard today (day 5) to chew as my teeth feel “bruised”. My biggest concern is the small gap they created on either side of my upper jaw. Food gets packed in there and it really hurts up against my gums which in turn makes brushing and flossing after eating excruciating. I find the worst part of my day is after I eat and have to put the trays back in. Owwwwwwwww is right! It’s like starting all over. No pain no gain I suppose. I’ll stick to it as most cases I’ve read have said it gets better. Thank you so much for sharing this. I am just on my 2nd day. Pain was pretty bad lady night. Good to know to expect 3 days of it! I’m curious to hear how Invisalign has helped you long term (in assuming you finished treatment) with the clenching and jaw pain. Hi Katie, it’s been night and day! I never have jaw pain anymore. I will say I still where my retainer trays every night, so they act as a night guard, but since doing that, I’ve been pain free! I just started today. Supposed to be on the 10 tray (5 month) plan. I hope that’s right! I agree with a lot of the comments about not being able to eat and drink when you want. I already basically just drink water, but i was drinking a big glass of tea at work throughout the afternoon. That quickly came to an end today. I also will have to adjust my eating habits. I am a runner, so usually try to eat small bits of protein throughout the day, but it takes too much time to pry out the trays, then brush and floss, then force them back in. Not worth it. Notice I didn’t say ‘snap’ them out and back in? Well, I know it’s day one, but so far it is pretty much a struggle to get them out/in. I hope it improves. The attachments (when you have they trays out) are more annoying than the trays. Especially after you eat. It feels like you have food stuck all over your teeth. So far, not too much pain. I hope tonight is good. Also, I heard you can order a tool to help you pop out the trays. Anyone use one? Ive had invisalign for 10 weeks,on tray 5 now. I have lots of attachments my botton front teeth which makes it really hard to get the bottom trays out. I bought one of those tools for $15…then I bought a very small crochet hook at Michael’s for $2.89. Guess which one works best??? Get a crochet hook, metal or plastic but the end has to be really tiny. I DO get food stuck in my attachments ( I have 18 total) and I hate them. You can drink anything you want, just alternate sips of tea, coffee, whatever with sips of water. Your trays may get a little stained, but they don’t get noticeably stained, plus you change them every 2 weeks. My 1st set looks the dingiest, but on your teeth you really can’t notice it. Also, the “retainer brits” tablets do a good job. I use antibacterial foaming soap on my trays and it works well. I drink iced tea and a diet coke occasionally with the trays in but i mainly drink water. I am only doing this for jaw related issues also, and when that gets better I’m done, I don’t care if I’m finished or not! I hate these things, and I had braces in college as a music major/clarinet player! Good luck, get a crochet hook! Thank you for this post! I got my first trays yesterday and was going out of my mind with the discomfort, hence the googling that led me to your post. Thank you for letting me know it will get better soon! I am on week three of my Invisalign treatment. I have found it fairly easy to adjust to for the most part. It is getting easier as I go. My question for you all is Do any of you change trays every week? My Orthadontist has me changing every week, not every two weeks. I have a total of 22 trays, after which time they will access if I need more or not. I’m just very curious as to the every week as opposed to every two weeks. I always switched mine every two weeks, but I’m sure every treatment plan varies slightly! Bring it up to your ortho and see what they say! I have a question as to how to make them not rub the sides of your tongue and the inside of your lower lip. My orthodontist gave me an emery board to smooth the sharper edges but at times the inside of my mouth is so sore I can hardly talk. My actual teeth pain is very minimal. Use Dental Wax. It really helped me until I got used to it! Thank you sooo much for your blog. I just started using my 1st try a few days ago and the side of my tongue to so swollen and sore from the rough edges. I will smooth this spot out immediately. I also have had a very difficult time removing the bottom tray……tearing both thumb nails. I happen to crochet and will be going through my hooks this morning. Thanks for everyone posting their very helpful comments. 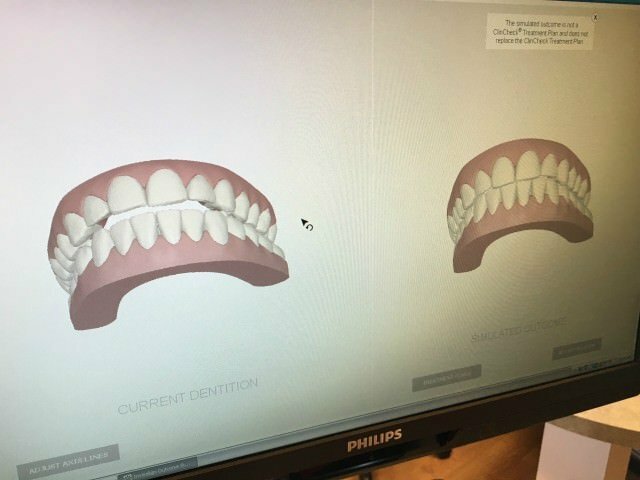 I just started with Invisalign two days ago and what’s driving me crazy isn’t pain, per se – it’s a feeling of a kind of… itching? in my gums (worse on top than on the bottom). Painkillers don’t make any difference at all – the only thing that provides relief is taking the trays out! I’m being very stoic at the moment, but I’m really worried that its going to be like this right through the treatment – I can’t take a year of my mouth feeling like this! I’ve been scouring the internet looking for anyone having the same itching I’m having!! did your itchiness go away? i want to rip out my teeth! I’m only on day 2 but oh my GOD it’s maddening!! Don’t panic, and stick with it – the itching will stop! Mine lasted four days, I think and then it just vanished, never to return (I was worried I’d have the same problem with each new set of trays. 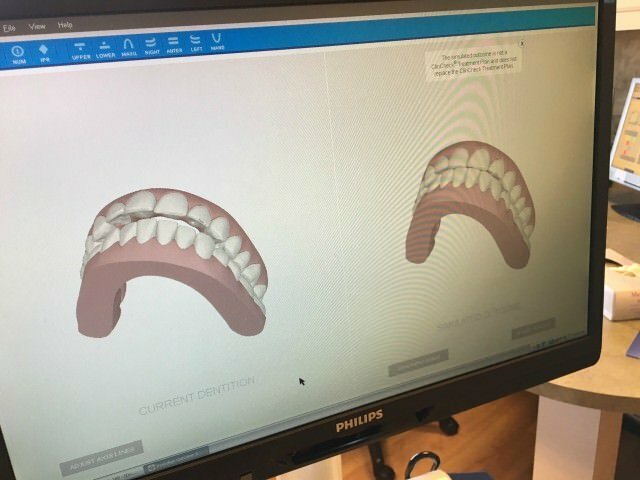 I’ve finished my alignment now and just have the retainers – the four days of itching will be worth it! Thanks for this blog post. Now that my sons (20 and 22) are done (1 traditional, 1 Invisalign), it’s Dad’s turn. I’m a month in to treatment (#3 of 33), with #4 and attachments coming tomorrow (on a weekly change schedule going forward). So far, I’m blown away by how easy this is–pressure, but no pain (maybe that changes tomorrow), and nearly zero impact on my speech. Mine felt like I couldn’t close my lips properly at first, but I forced it and it got better over time. Hope it’s the same for you! I see. Thank you for sharing your experience! I am currently on week #5 of a 16 week plan. I am closing a gap. It has closed significantly in just 5 weeks! I was instructed to keep them in for 22 hours per day for best results. I hope everyone gets the results they wish for! Please continue to share your progress! I am going to explore getting Invisalign this year. I have (mostly) straight teeth which never required orthadontics – however – my bottom teeth have been chipping and wearing away for the last decade or so because my bite is SO TIGHT. My dentist said I needed to consider something to adjust that bite (like Invisalign) because even if they fixed/bonded my chipped teeth, it would eventually wear away again because I hadn’t addressed the root problem. THEN after bite is adjusted, they can repair my teeth. So next time I go in to the dentist, they’re going to do my evaluation and send my scans off to determine cost and plan. Wish me luck!! I’m so glad I found this blog. I just started my treatment yesterday. My teeth are so but I guess that is expected.. My question is how long will the buttons stay so sharp? When the trays are out they are so darn sharp. I am a loss at what to do about it. Will they dull after putting trays in and out after awhile. I’m fortunate that I only have them on the lowers. I felt it took about a week to adjust to the mouthfeel of the attachments. Hang in there; it gets better! I just put in my second set of trays. I have them on top and bottom. I have 13 sets and was told to change them every 10 days. How did it usually feel when you switched out trays? Was it as painful as the first time? Was it pretty snug? I was advised to switch out trays at night and take some Advil at bedtime, so that’s what I’m going to do. I am also going to buy a teething ring so that I can ice the inside of my mouth (and also laugh at myself). So far, this is my experience: The first few days were pretty painful. My nephew, who will have braces in his future, asked me what they felt like. I described it as having a headache in my mouth. Chewing was not comfortable. I don’t advise eating spicy foods, as it takes longer to chew due to sensitivity issues. My mouth has also been pretty cut up from the edges of the trays. Using a file didn’t work, so I coated the outside of the trays with orthodontic wax where they rubbed wrong. That has worked the best. I’ve had a pretty fierce lisp, but I’m slowly figuring out my way around that. The letter S has been the worst. I have until mid-July to wear these trays. Hopefully all goes smooth. It’s definitely gonna be an experience, but I know the results will be worth it! The first tray switch was painful for me, but each one after that felt easier. I hope you have the same experience! Im on my first day and I can’t explain how painful and restless I am. This is horrible. SO ANNOYING. I just want to sit in the corner and focus on being okay. I can’t think, talk or type this comment. Hope I can make it lol Im being a baby. DAY 2: feeling 1/2 the discomfort as yesterday. Still want to punch a hole through the wall though..I work in sales and don’t want to make a single call. Don’t really feel the need to go in the corner today, so I’ll just sit at my desk and slightly clinch my jaw and wait this b**** out. Brittany was definatly right about the pain disappearing after day 3. I Can finally think again! Jaw clenching is still an issue though… but not that big of a deal. I have a pretty severe issue where my dentist recommended that I straighten my teeth or risk losing them when I’m older due to periodontal disease and some weird bite issues in the back. So I’m in the 2nd year of a 2- year plan of Invisalign (and that’s with switching trays every week! more than 60 trays before refinements begin!) Traditional braces and ceramic braces were also offered, but my orthodontist believed that Invisalign would provide the best, most permanent result. I wore braces for four years when I was a teenager, and I can definitively say that Invisalign is far less painful and far more convenient. I would have been fine with wearing traditional braces again if it meant saving my teeth, but I do prefer my Invisalign. 1. when it’s time to change trays, change trays at night. You’ll sleep through the initial pain. 2. expect new tooth pains with each new tray change. Each new tray is working on a different tooth or section, and you can’t really predict which section it’s going to be. 3. for me, at least, this pain is more uncomfortable than actual pain. My mouth is a little tender the first day or two after a tray change–it’s a little like when a thorough dental hygienist works at your mouth. 4. your teeth will never be whiter. you brush your teeth all the time, plus, if you’re worried about the lack of saliva like I am, then you’re using mouthwash than further adds to the whitening properties and the trays act like little whitening trays. I’ve been wearing Invisalign for a very long time now (I think I’m on tray 40? of 60? before refinements…). Anyway, it’s also recommended that I wear them 22 hours/day, but that’s really just unrealistic if I want to have a life. I make it a goal to wear them 20 hours/day. I’m still making the necessary progress, and I can still eat and drink and have a life. I had one hiccup when I went on a vacation to Paris–every meal there is easily 3 hours long two times every day for a week, plus all the wine? the bread? the desserts? Sorry, teeth, but you’re going to have a take a break if I’m in Paris! I just wore that assigned tray for a bit longer, the teeth caught up, and all was well. Anyway, my message to you is this: do your best to wear your aligners as much as possible, wear them more on days when you don’t have special things planned, but go ahead and live your life, too. I’m on day 2 and I’m dying in pain. I have so many of those notches all over the place and my upper inside lip is so cut up. I’m about to throw in the towel not sure if this is going to get any better. I suffer from TMJ and was hoping that this would train my jaw not to clench which it seems like it will if I can endure it. Don’t know how to ease the pain of the notches though. Any ideas? Your lips will toughen up after a few days so I’d encourage you to stick it out! If the plastic trays are in, the notches should be smooth at least, correct? Hi Brittany, Bad news. Your molars will never touch again. Reason: the space was created by the 2 retainers and if the doctor did not correct for the thickness of the retainers, and the gap space, your teeth will never settle. I had Invisalign done in 2005. And my back teeth touched before the trays. Not anymore. And many other people are suffering from this horrible product. The dentist says it is Invisaligns fault. Invisalign says it is the dentists fault. The ortho says it was my fault for choosing Invisalign and I should have had braces at 40 years old. Now what? My front teeth are getting all chipped up, a cross bite is forming, I now have a lisp, and people cant understand my speech anymore, and my front teeth are slowly grinding down and are noticeably shorter. Invisalign has offered me a lab fee credit to do the process again. Really? And risk more problems? This is so upsetting to me. I didnt need the teeth straightening to begin with. It was an offer from my dentist because insurance and the dentist would cover all the costs. He said my top teeth center line did not match the bottom center line. This was the biggest mistake and regret so far of my life. I am unable to chew food and unable to to speak properly with a new speech impediment. That’s terrible, you should get a good lawyer. I am one week in and have had very little pain. However, I am still hyper-aware of the trays being in my mouth. It is so annoying and I find myself thinking about it and looking up stuff online all day. How long does it take before you don’t notice the trays being in your mouth? I feel after a couple weeks I got used to it, but I never forgot about them completely. They weren’t fun, but they were worth it for me! Glad I found this post! Day 1 for me. The absolute worst was the procedure to ad stage little bracket/notch thingies put on (I have several) having my mouth pried open for only 10 minutes did a number on me! 4 hours later and I can barely chew food. Anyone else have that? I feel like I felt after I had my wisdom teeth removed! Ortho said paid should be gone tomorrow, but it just seems like way too much pain for the short amount of time my mouth was open. Otherwise trays feel ok, but far from invisible, and yeah taking out the bottom tray especially is near impossible! Glad to read the comments/tips here. Thanks! I am a week in, very little pain, I wear them 23 hours per day. I have 19 trays. Pleased so far. second week 12 more weeks to go. putting them on is worse than labor pain. I use orajel or viscous lidocaine to help with the pain, it helps a little. I am always hungry but scared to eat for fear of feeling pain when I have to put them back on. I am 49 and still have 4 baby teeth . as I get older my gaps were spreading to the point where it looked like I was missing teeth. hoping to lose weight and have a nicer smile when this torture is up. Putting the top ones are extremely difficult and painful. . anyone else have problems putting the top ones on? Thanks to everyone who contributed to this blog! So helpful! Day 1 wasn’t painful but I did have pressure and it wasn’t so uncomfortable. I wanted to rio my teeth out. I am now finishing day 2 and I still want to rip my teeth out but it’s better than yesterday. I am looking forward to tomorrow! I didn’t do my research so I really was surprised about the no snacking and no drinking anything but water (unless you brush)…Much more adjusting than I expected. I also wasn’t expecting to brush after eating and how much the food will stuck in the notches. The positive is that I’m taking much better care of my teeth and maybe I’ll lose weight because I’ll be cutting back on the snacking. Thanks for all this info! I was going to do Invisalign and not decided not to, or to at least wait until things are less crazy at work. I don’t know how I would deal with the inability to eat every 1-2 hours. I’m hypoglycemic and the continual eating of specific foods throughout the day keeps me feeling great and sharp at work. Plus I suspect my dentist is partially recommending it for her personal gain – she just got certified for Invisalign. I’ve been going to her for 10 years and only last month did she suggest I needed to do anything to fix a cross bite and one slightly crooked tooth. Day 2 and I’m in more pain than yesterday and my tongue is sore and cut. I keep rubbing my tongue along the bottom of tray so probably my fault. Doesn’t help that I’ve got full on flu so can’t close my mouth as my nose is all blocked! Doh! Hoping this gets better as I’ve got 9 months of this ahead of me. Taking them out to eat is annoying but I just keep thinking of the end result and how much I’ve paid so I can’t afford to give up! I’m so worried my teeth will move after treatment-I know they give you a night retainer but I’ve been given the option of the permanent retainer-what are people’s thoughts? Is it the angle of the pictures or did it really make your dental arches narrower? A proper orthodontic treatment makes the arch wider or leaves it the same if it’s already wide enough. It’s more aesthetically pleasing, removes the need for tooth extraction and leaves space for the tongue on the roof on the mouth, where it should be at all times. Thank you for all the info! I’m considering invisaline. My teeth are straight, but I have an overbite and my teeth are narrower toward the front. One thing holding me back is that I need to be able to sing because I’m in a band with my husband. We practice daily & occasionally perform 2-3 a week. Anyone experience problems singing with Invisalign? I started mine yesterday and I’m on Day 2. I am hypoglycemic so I’m worried having to take out my trays constantly to eat food every 2-3 hrs. Anyone who suffer from hypoglycemic has any suggestion? Hello! I started Invisalign treatment yesterday! , was it normal for you feeling your teeth sensitive at the beginning when you were eating? It feels weird when I bite, my teeth feel they are gonna fall! 🙂 is a very bad sensation when I try to bite. Totally normal! Your teeth will be sensitive at first as they start moving. Thanks for posting your experience, it was helpful to read. I’m on day two and OWWWWWWWWWW is about right! 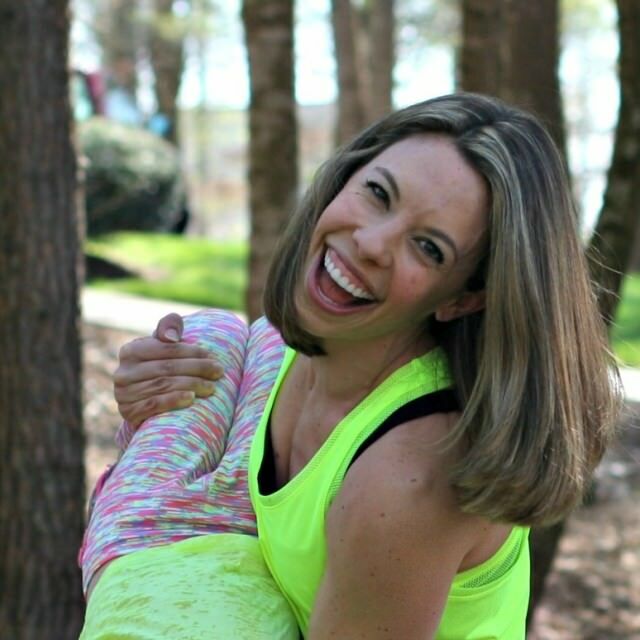 Reading that your pain subsided has given me hope!